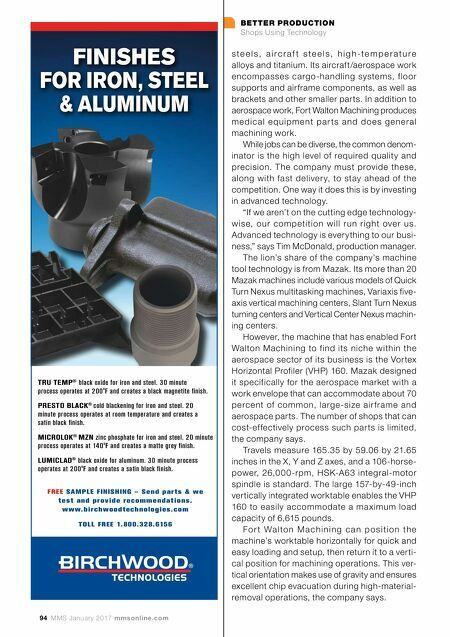 BETTER PRODUCTION Shops Using Technology mmsonline.com January 2017 MMS 95 Fo r t Wa l to n M a c h i n i n g's V H P 16 0 m o d e l features two-table-changing capability for con- tinuous, uninterrupted operations. If needed, the shop can expand its single-machine, two-table configuration into a manufacturing cell with the addition of both tables and machines. The profiler has a special box-type construc- tion that integrates its base, column and table to provide maximum machining rigidity for over- all par t accuracy. Fur thermore, the machine's symmetrical base/column construction works i n c o n j u n c t i o n w i t h a n a d v a n c e d c o o l a n t a n d c h i p d i s p o s a l sy s te m to m i n i m i ze h e at displacement. 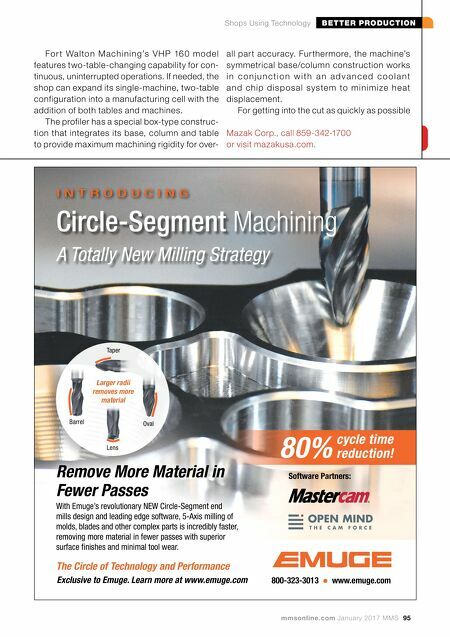 For getting into the cut as quickly as possible Mazak Corp., call 859-342-1700 or visit mazakusa.com. I N T R O D U C I N G Exclusive to Emuge. Learn more at www.emuge.com Remove More Material in Fewer Passes With Emuge's revolutionary NEW Circle-Segment end mills design and leading edge software, 5-Axis milling of molds, blades and other complex parts is incredibly faster, removing more material in fewer passes with superior surface finishes and minimal tool wear. The Circle of Technology and Performance 800-323-3013 • www.emuge.com Software Partners: Circle-Segment Machining A Totally New Milling Strategy Barrel Oval Lens Taper Larger radii removes more material 80% cycle time reduction!